Another Smartphone battle won by Samsung. R.I.P Nokia. Samsung Electronics Co. snatched the title of world’s largest mobile-handset vendor from Nokia Corp. in the first three months of the year, as Nokia continues to struggle against fast-moving competition. Three Quarters after, Samsung established as the leading shipper of mobile phone handsets in the world. How did this happen? The same way a runner in any race pushes to the front: He speeds up, while the other guy slows down. According to market intelligence firm ABI Research, worldwide handset shipments decreased 1.9% YoY to 387.3 million units in Q3 2012. Worldwide smartphone shipments increased 32.8% YoY to 155.5 million over the same period. Samsung retained the lead position in both handset and smartphone shipments. Underscoring its accomplishment, Samsung shipped more than double the smartphones of second place Apple. According to the data provided, Samsung looks to be running away from the pack while Apple’s new product portfolio continues to eat into its decreasing gross margins. 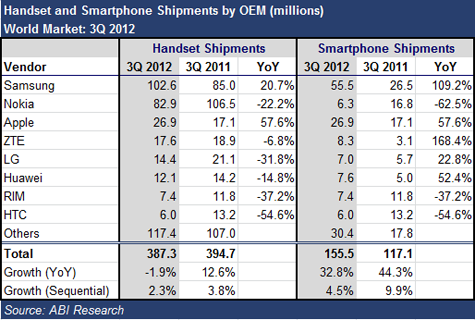 Apple still needs to ship over 94 million smartphones in Q4 if it wants to match its 2011 shipment growth of 96 percent. Nokia smartphone shipments declined 38% from Q2 2012 to 6.3 million as its current Lumia line of smartphones cannot be upgraded to the upcoming Windows Phone 8 software release. With competing OEMs looking to take advantage of the WP8 platform, Nokia will have trouble remaining a top ten smartphone OEM in Q4. LG returned to profitability on the back of strong LTE smartphone shipment growth while ZTE showed the best YoY smartphone shipment growth of 168.4%. RIM and HTC both continued to struggle with their smartphone strategies and portfolios by experiencing YoY smartphone shipment declines of 37.2% and 54.6% respectively. Amazing stuff, and insightful advise to telecom operators. As written before, when a certain handset brand gets into the shipping “death corridor” the quicker the operator get it out, the best for the overall financial performance. Nokia needs to succeed in its current self-reinvention. The accompanying beautiful design work coming from Nokia’s hardware division, has been truly incredible but beautiful design and the most interesting innovations, while an indicator of potential greatness, are lousy at arresting downward momentum. A fall from grace was overdue, and it’s finally materialized. After watching storm clouds gathering on the horizon for months, a massive 22% decline in handsets shipped year-over-year and 62.5% decline in smartphones shipped, is Nokia’s barometer finally crashing into the basement. RIP Nokia.